We are at the verge of a disaster and this disaster comes in the form of mental illness. Approximately 1 in 5 Americans will experience mental health issues by 2018. We may ignore this fact but situation won’t improve. So it is our responsibility to identify solutions to keep our future generations healthy. Deakin University, Melbourne suggests a possible way forward – “contact with nature may provide an effective population-wide strategy in prevention of mental ill health”. One such form of therapy comes through pets we keep! Pets like dogs and cats and even fish. Keeping fish helps to release stress and improves mental health. And when you keep fish in an aquarium you can achieve even more if you decorate the habitat like nature with real aquatic plants and substrate and bog woods. This new art is called aquascaping. Let’s take a look at the picture with this article. These plants are real and not much hard to grow to achieve such lush in colors. Be it your bedside table or office desk, you can manage a small aquarium for a betta fish and make an aquascape as great as this without much effort. When you are stressed, take a few moments off and observe your tiny aquatic friends and you will feel recharged. A study in the 90’s showed that displaying aquariums with brightly colored fish helped to reduce the disruptive behavior of Alzheimer patients. Mayo clinic researchers claim that keeping fish can improve mental health and help to reduce anxiety. So the question is how to start. Well it is not tough as mentioned before. Choose an aquarium that fits the space you can spend. Then you need to carefully select a fish considering it’s requirement of water volume. If you can afford a large tank you can go for variety of fishes and large monstrous ones. But if the space is limited you can get betta, tetra, rasbora or some other small fishes. 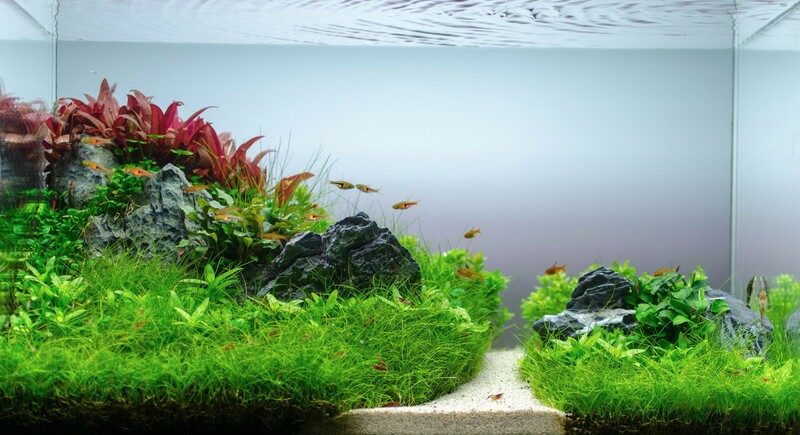 To create an aquascape you will need aquatic plants. And to grow plants you need special substrate called aquasoil. To grow the plants you will need a good light. There are lots of cheap LED lights available in the market to help you out. If you don’t go for the high demanding plants then you probably don’t need a pressurized CO2 system. Before adding fish remember to cycle the tank and use a good filtration system for the health of your little friends. It usually takes 3 to 4 weeks to completely cycle a tank. After your tank is established you need minimal maintenance. Which includes water chance once per week. Change only 30-40% of water at a time. And when the plant grows heavily you need occasional trimming. Comparing the time and effort requires the aquarium is immensely rewarding. And with a aquascape you can make people awestruck. So go for it and happy fish keeping! I am an aquarist to the core. Love all kind of aquatic flora & fauna. Part time blogger and full time hobbyist.